ADDvantage® is a member of a Realtor® Board that utilizes the My Florida Regional MLS. ADDvantage® brokers have membership in many Realtor® boards, providing sellers with many possible MLS choices in which to be listed. The My Florida Regional MLS includes all listings from the Bartow Board of Realtors, the Central Pasco Board of Realtors, the Desoto County Board of Realtors, the East Polk County Assoc. of Realtors, the Englewood Area Board of Realtors, the Greater Orlando Assoc. of Realtors, the Greater Tampa Assoc. of Realtors, the Lake Wales Assoc. of Realtors, the Lakeland Assoc. of Realtors, the Manatee Assoc. of Realtors, the Orlando Regional Realtor Assoc., the Osceola County Assoc. of Realtors, the Pinellas Realtor Organization, the Punta Gorda-Port Charlotte-North Port Assoc. of Realtors, the Realtor Assoc. of Lake & Sumter Counties, the Sarasota Assoc. of Realtors, the Space Coast Assoc. of Realtors, the Venice Area Board of Realtors, the West Pasco Board of Realtors, and the West Volusia Assoc. of Realtors. The Bartow Board of Realtors is one of the oldest associations located in Polk County, Florida. It is the county seat of Polk County as well. Bartow was named after the first Confederate officer who died in the American Civil War, Francis S. Bartow. Bartow is not one of the most populated cities in Polk, but it is the second largest in geographical area. Much of Bartow is built on the Fort Meade soil series, which is well drained, high in organic matter, and rich in phosphorus; an uncommon combination in Florida. In the movie, My Girl, the home that the main characters, Anna Chlumsky and Dan Aykroyd, live in is the Stanford Inn located on 555 East Stanford Street, Bartow, FL 33830. Several athletes and political figures were born in Bartow: Baltimore Ravens linebacker Ray Lewis and player Keydrick Vincent; Houston Rockets' Tracy McGrady; Current US Congressman Adam Putnam and Former US Congressman Katherine Harris. The Desoto County Board of Realtors is located at 10 South De Soto Avenue, Suite C, Arcadia, FL, 34266. This Board of Realtors was started in 1956. Its county seat is Arcadia, FL. During World War II, DeSoto County operated the Carlstrom Field Air Base, which provided training for both American and British pilots. Twenty-three British pilots were killed while training at the base and are honored at DeSoto County's Oak Ridge Cemetery, which is located in the town of Arcadia. EPCAR is located at 700 Avenue B S.W., Winter Haven, FL 33880. Polk County was created when Hillsborough County was split into eastern and western halves. The eastern half was named after the 11th President of the United States, James Polk. Polk County holds the title of having Florida's First Theme Attraction: Cypress Gardens in Winter Haven. Today, it is home to Fantasy of Flight, Sun 'n Fun, and an optical illusion hill known as Spooky Hill where cars appear to roll uphill. Lake Wales is located directly in the center of Polk County, west of Lake Kissimmee and east of Tampa. The Englewood Area Board of Realtors is located at 3952 North Access Road, Englewood, FL 34224. Englewood was the original name for Vineland, FL in Orange County. The city of Englewood is actually split in half between two counties: northwestern Charlotte County and southwestern Sarasota County. Englewood has a triple threat, the Englewood Sports Complex, Indian Mound Park, and Englewood Beach. Englewood has only one high school, Lemon Bay High School, and students from both Charlotte and Sarasota County attended school from 9th to 12 grade. The Greater Tampa Association of Realtors is located at 2918 W. Kennedy Blvd, Tampa, FL 33609. Tampa is located in Hillsborough County and is the county seat for Hillsborough. The city of Tampa is filled with historical facts and wonderful traditions. In 1885, the Tampa Board of Trade helped broker a land deal with Vicente Martinez Ybor to move his cigar manufacturing operations from Key West to Tampa. Due to the influx of cigar workers and the little population, Mr. Ybor built hundreds of small houses in the immediate vicinity of his factory, and Ybor City was made, which made Tampa a major cigar production center. In 1904, a local civic association of local businessmen dubbed themselves Ye Mystic Krewe of Gasparilla (named after local mythical pirate Jose Gaspar), and staged an "invasion" of the city followed by a parade. With a few exceptions, the Gasparilla Pirate Festival has been held every year since then. Tampa is home to MacDill Air Force Base, Tampa International Airport, Channelside, Ybor City, International Bay Street and Plaza, the Seminole Hard Rock Hotel and Casino, Busch Gardens, Adventure Island, MOSI, etc. Whatever your pleasure, you can find it Tampa, FL. Gambling, drinking, rollercoaster rides, science wonders, dinning, shopping, dancing, it’s all here; along with some awesome colleges, University of South Florida, Hillsborough Community College, and Strayer University. I almost forgot…SPORTS!!! Tampa is home to the Tampa Bay Buccaneers (NFL), The Tampa Bay Rays (MLB), USF Bulls (College Football), USF Bulls (College Basketball), and the Tampa Bay Lightening (NHL). Several Fortune 500 company headquarters are located in Tampa as well: OSI Restaurant Partners who own Outback Steakhouse, Carrabba's Italian Grill, and Bonefish Grill; WellCare Health Plans, Inc; TECO; and Raymond James Financial. It holds the place as the seventh largest port in the Nation. The Tampa Port Authority serves as a port of call for Holland America's MS Veendam, Royal Caribbean's Grandeur of the Seas, and Carnival's Legend and Inspiration. The purpose of this organization is to serve Realtor Members by providing programs and promoting services which will enable those Members to successfully conduct themselves, and their profession with integrity and competency. The Lakeland Association of Realtors is stationed at 820 South Florida Avenue, Suite 100, Lakeland, FL 33801. Lakeland is located in Polk County. Lakeland is the largest city, and is located midway between Tampa and Orlando on I4. It is also the spring training headquarters for the Detroit Tigers. In 1990, Lakeland made its Hollywood debut when the Southgate Shopping Center was featured in the hit movie Edward Scissorhands, starring Johnny Depp and Winona Ryder. Publix founder George Washington Jenkins moved the company headquarters sometime in the 1940s. From 1923 to 1927 the Cleveland Indians held spring training at Henley Field Ball Park. Lakeland has been home to several celebrities including University of Califoria-Berkley Running Back Justin Forsett and the 1953 Miss America, Neva Jane Langley. The Lakeland Center held the 1978 opening show for The Rolling Stones for their US Tour. MCAR is located at 10920 Technology Terrace, Lakewood Ranch, FL 34211. Every January Manatee County hosts the Manatee County Fair at its fairgrounds. Some major cities in Manatee County are Bradenton, Palmetto, Longboat Key, and Anna Maria Island. Bradenton is the county seat of Manatee and as well is the largest city in the county. Tropicana Products was founded in 1947 in Bradenton. Bradenton's famous residents have included tennis players Tommy Haas, Maria Sharapova, and Taylor Dent. Aerosmith's Steven Tyler has a home in Bradenton as well. Longboat Key is a island that is divided almost equally between Manatee and Sarasota. There are numerous restaurants on Longboat Key, including The Dry Dock, the Longboat Key Club Restaurant, Cafe On the Bay, Euphemia Haye, Harry's, Columbia, Cork, The Bottle Shop, Moore's Stone Crab Restaurant, Mar Vista and The Old Salty Dog. Anna Maria Island is comprised of 3 cities. To the north is the city of Anna Maria, Holmes Beach sits in the center, and Bradenton Beach occupies the south. The Orlando Regional Realtor Association's office is located at 1330 Lee Road, Orlando, FL 32810. More than 11,000 realtors hold membership with ORRA from Hillsborough, Lake, Orange, Osceola, Polk, Seminole, and Volusia counties. Orlando is the county seat of Orange County and is as well the largest city in Central Florida. Orlando has various tourist attractions, including SeaWorld, Universal Studios/Islands of Adventure, Dolly Parton's Dixie Stampede Dinner and Show, Medieval Nights, Arabian Nights, Wet and Wild, and of course Orlando's largest and most profitable attraction the Walt Disney World Resort. When it comes to number of hotel rooms, Orlando only comes in second to Las Vegas, NE). However, Orlando is known for much more than just attractions. The University of Central Florida is located in Orange County, as well as Valencia Community College. Along with several entertainment centers, there are numerous golf courses, restaurants, gift shops, and malls. OSCAR, also known as Osceola County Association of Realtor's office is at 1105 Shady Lane, Kissimmee, FL 34744. OSCAR became official on October 1, 1950. Today, OSCAR represents over 3,000 Realtors and Affiliate members. Kissimmee is the county seat of Osceola. Notable residents of Kissimmee include or included Backstreet Boys singer A.J. McLean and one of the original Green Berets, Colt Terry. Yeehaw Junction is a community/tourist attraction in Osceola County. Yeehaw Junction is an intersection of US 441, SR 60, and the Florida Turnpike. It is approximately 30 miles west of Vero Beach and 30 miles north of Lake Okeechobee, FL. St. Cloud is a city south of Kissimmee. St. Cloud has tried to separate itself from neighboring cities, and particularly the theme parks, by promoting an image of small town life, as well as attempting to make itself economically less dependent on Kissimmee. On March 6, 2006, St. Cloud introduced CyberSpot, a program which gives residents free high-speed wireless Internet access. The city is serviced by the Osceola library system. The Pinellas Realtor Organization was established in 2002 as the result of a merger between the St. Petersburg and Clearwater Board of Realtors. Its main office is located at 4590 Ulmerton Road, Clearwater, FL 33762. This association represents over 7,000 members. Pinellas's county seat belongs to Clearwater and its biggest city is Saint Petersburg. Pinellas County consists of several high-end cities such as Clearwater, Saint Petersburg, and Tierra Verde. Clearwater was named a city and became the county seat on May 27th, 1912. In 1915, a bridge was built across Clearwater Harbor, joining the city with modern-day Clearwater Beach. Clearwater was a major training base during World War II for troops destined for Europe. The city hosts several events throughout the year. From April to May the Fun N Sun Festival is held at Pier 60 in Clearwater Beach. In October they have the Hispanic Heritage Festival and the Clearwater Jazz Holiday. Famous residents of Clearwater have been Lisa Marie Presley, Hulk Hogan, Evel Knievel, and Ricky Carmichael. Saint Petersburg is Pinellas's largest city, known as a vacation destination for North Americans and European residents and a battleground for U.S. Presidential politics. Its nickname is "The Sunshine City", due to the 360 days of sunshine each year. Northern residents from such places as New York, Chicago, and Philadelphia enjoy the warm sun and bring an influx of income into the city. Saint Petersburg is home to Tropicana Field where the 2008 ALCS Tampa Bay Rays are set to face the Philadelphia Phillies for the 2008 World Series. Tierra Verde is a small city almost at the bottom tip of Pinellas County and located at the end of Tierra Verde is Fort DeSoto (Pinellas) County Park. It is a total of 667 acres big, with approximately 2,000 single-family and multi-family structures valued over $600 million. The association recently joined forces with MID-FL Regional MLS System so that Realtors have access to more listings and clients have more exposure for their listings. Located in Charlotte County, FL; Port Charlotte is home to the Port Charlotte Town Center Mall, the Charlotte County Administration, as well as Charlotte Sports Park which will be the spring training home of the Tampa Bay Rays beginning in 2009. Port Charlotte has experienced a tremendous boom in land values between 2003 and 2005. About 800 acres of old platted lots in a portion of central Port Charlotte was taken by the county via eminent domain and will be developed into a big mixed-use development by Kitson and Partners, who was also awarded the contract with the State of Florida and Charlotte County to develop the Babcock Ranch Project. Also located in Charlotte County is the county's seat, Punta Gorda. Punta Gorda occupies a point where the Peace River meets Charlotte Harbor. Located in Sarasota County, FL; North Port is a city in Sarasota County. North Port is a rapidly growing municipality containing very large-scale residential subdivision along with an extensive network of streets. The municipality has annexed nearby locales including the area known as Warm Mineral Springs. We believe you'll find that Lake County, the land of hills, trees, and lakes, is probably the BEST area in Florida to live. Our rolling terrain and scenic beauty make us unique in Central Florida. The county's population has a median age of 44.8 years which confirms Lake County's well-established residential foundation and desirability as a retirement location. You'll find Lake County is centrally located - close enough to where you wish to go, yet not in the midst of the BIG cities. Whether considering a place to raise your family or retire, we encourage you to take a close look at Lake County and the many benefits it can offer. Since 1923, the SAR has provided our members with the resources they need to enhance professionalism and ensure their continued growth and success to better serve those they represent. This association is located at 3590 South Tuttle Avenue, Sarasota, FL 34239. Sarasota is the county seat for Sarasota County. The association recently joined forces with MID-FL Regional MLS System so that Realtors have access to more listings and clients have more exposure for their listing. The city of Sarasota has been part of three American counties depending upon the era. Created in 1834 while Florida was still a territory, Hillsborough County was further divided in 1855 placing Sarasota in Manatee County until 1921, when a new county, among three new ones carved out of portions of Manatee, was created and called, Sarasota, with the city being made the seat of the new county. The city of Venice has been listed in many publications as being the "Shark's Tooth Capital of The World". It hosts an annual festival, the Shark's Tooth Festival, every year to celebrate the collection of shark's teeth that can be found on its shores. In addition to finding shark's teeth on beach shores, many large sized teeth can be found free diving off of the coast or by digging in the many shell deposits that are left over from the dredging of the Intercostals Waterway. Covering all of Brevard County, the Space Coast Association of Realtor's main office is located at 105 McLeod Street, Merritt Island, FL 32953. Brevard County's nickname is Space Coast, named after the John F Kennedy Space Center that sits directly on Merritt Island. Another hugh tourist attraction in Brevard County is Cape Canaveral. Cape Canaveral is reportedly the oldest name of a place in America, thanks to Ponce De Leon in 1523. Cape Canaveral is home to part of Patrick Air Force Base, the detached Cape Canaveral Air Force Staton which is operated by the United States Air Force. The association was started in 1959. Today, the Space Coast assists close to 1,300 Realtors and Affiliate Members. The Venice Board of Realtors services over 750 Realtors in Venice, Nokomis, and Osprey. 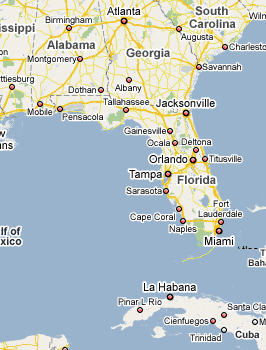 All three cities are located in Sarasota County, FL. The board's main office is located at 680 Substation Road, Venice, FL 34285. Since 1993, the Venice Area Board of Realtors has raised over $150,000 in student scholarships and the Board has been honored over 30 times by the Florida Association, making them the only association in the history of Florida Association to have that many awards. In 2002 the Board was honored as Business of the Year by the Venice Area Chamber of Commerce. Venice is known for its large snowbird population and for being the Shark Tooth Capital of the World. Every year the city of Venice hosts the Shark's Tooth Festival, a festival to celebrate the abundance of fossilized shark's teeth found on the shores of the beaches. The teeth in the area can vary in size from an eighth of an inch to 3 inches and, on occasion, even bigger. Nokomis is a small community in Sarasota County, FL. It is famous for Casey Key, a small barrier island with homes valued in the millions. Some of the notable residents include novelist Stephen King and pro tennis player Martina Navratilova. Approximately 1,000 realtors are members of the West Pasco Board of Realtors. Located at 5409 Sunset Road, New Port Richey, FL 34652, the WPBOR covers all listings in Pasco, Pinellas, Hillsborough, and Hernando counties. Pasco's county seat is located in Dade City. New Port Richey, Port Richey, Shady Hills, Hudson, Holiday, Trinity, Bayonet Point, and Aripeka are some of the cities located in West Pasco. Dade City, San Antonio, Zephyrhills, Saint Leo, Triliby, Lacoochee, Wesley Chapel, and Crystal Springs are located in East Pasco County. Pasco County was created in 1887 from the southern part of Hernando County. It was named for Samuel Pasco, who served in the Confederate Army, the state legislature and in the United States Senate from 1887 to 1899. In 1962, County star Johnny Cash's 2nd wife June Carter Cash's mom and dad purchased a house in Port Richey and Johnny visited Port Richey quite often throughout his life. Pasco County is home to 44 elementary, 14 middle, 10 high, and 1 middle/high schools. As well there are 4 colleges located throughout Pasco County. The association is located at 425 South Volusia Avenue, Orange City, FL 32763. DeLand is the county seat, Deltona is the largest city, and Daytona Beach is the well-known city of Volusia County. West Volusia includes cities such as Barberville, Debary, DeLand, Deltona, and Orange City. Some of the major attractions in Volusia County include the Volusia County Fair and Expo Center in DeLand and Volusia Speedway Park. West Volusia is also known as Saint John's River County. DeLand is home to Stetson University and the Museum of Florida Art. Downtown DeLand's main street, Woodland Boulevard, has a number of notable 19th century buildings. DeLand has been the filming location for several television and movie projects, with the most notable being the 1999 Adam Sandler comedy The Waterboy. Scenes showing the fictional South Central Louisiana State University Mud Dogs home football games were shot at Spec Martin Stadium. Classroom and exterior scenes were filmed at Stetson University. Scenes involving Sandler's character's home were actually filmed in neighboring DeBary. Note: ADDvantage® is not the My Florida Regional MLS. ADDvantage® utilizes the My Florida Regional MLS Multiple Listing Service system to provide flat fee MLS listings.